St. Dunstan was the son of a West Saxon noble, named Heorstan, and his wife, Cunethrith. He was born in AD 909 at Baltonborough, Somerset and received his early education from the Irish monks who had settled at Glastonbury. 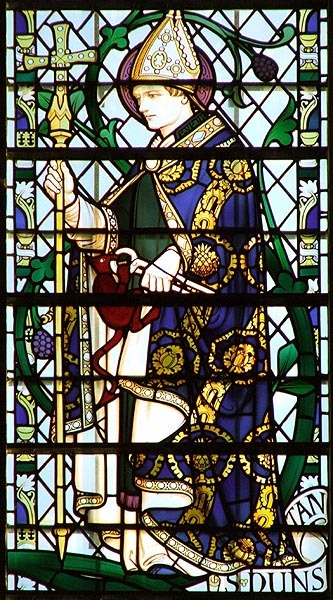 After living for a time at the Court of King Aethelstan, he became a monk at Glastonbury and devoted himself to the study of the Scriptures and to prayer. At the same time, he became skilled in the arts of painting and music and metalworking, particularly the making church bells and organs. Having been summoned to the Court of King Edmund the Magnificent, he became one of his chief councillors. The King, however, lent too ready an ear to malicious accusations which were brought against Dunstan and dismissed him; but afterwards regretted his injustice and made him Abbot of Glastonbury. Soon after, he became the treasurer and chief adviser of King Edred and the Queen-mother; but powerful enemies drove him from the Court of King Edwig All-Fair and he was obliged to take refuge in Flanders until the accession of Edgar the Peacemaker, who recalled him and made him his chief minister. He was also appointed Bishop of Worcester and of London and, in AD 960, became Archbishop of Canterbury. Amongst all those who have directed the government of the State whilst holding the highest office in the Church, Dunstan is entitled to a place of honour. He laboured with no small success to establish peace amongst the different peoples settled in England. He sought to raise the standard of monastic life. He built and endowed churches. He delighted in teaching and encouraged the clergy to acquire knowledge that they might be the teachers of the nation. After the brief reign of King Edward the Martyr had been closed by his tragic death, Dunstan took part in the Coronation of Aethelred the Unready. His death occurred at Canterbury on 19th May AD 988 and his body was claimed by both Canterbury and Glastonbury.